Reversible - Can be used rear-facing for children 5 to 45 lbs / 2,3 kg - 20,4 kg, and forward-facing for children 22 to 65 lbs / 10 kg - 30 kg. SIP - Side Impact Protection protects child's head, neck and spine. 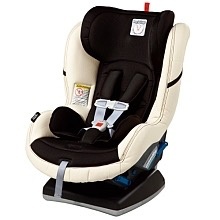 Easily adjusts to 10 different positions, even with child in the seat, ensuring the best and safest fit. EPS - Energy-absorbing foam, Expanded Poly Styrene, in shell and head panel protects child's head and torso from impact forces. SAFE - A Shock Absorbing Foam Element device located below the shell crumples upon impact, reducing stress on child's neck and shoulders in the event of a crash. Anti-Rebound Bar - Solid anti-rebound bar for use in rear-facing mode. Conveniently folds under the base for forward facing mode. Contoured Steel Back Plate - Minimizes flexing and reduces forward movement. Quick-Release, Five-Point Safety Harness - Made with a "cobblestone" webbing of extra-strong polyester thread; equipped with shoulder pads and chest clip. Contoured Base - Provides extra stability in any seating position. Top Tether Hook - Increases stability in forward-facing mode and limits forward movement. UAS - Adjustable UAS connectors add stability and are easy to reposition for rear-facing and forward-facing installation. Fresco Jersey Performance Fabric - Superior quality Fresco Jersey fabric found in head panel and removable cushion is easy to clean, breathable and absorbs moisture - keeping child cool and comfortable. Wide Padded Seat - Includes a specially shaped, removable cushion for newborns to be used until the baby reaches 22 lbs / 10 kg. Made in Italy - All Peg Perego baby products are Made in Italy. From concept, to creation, every step in the process is performed by Peg Perego and no one else. 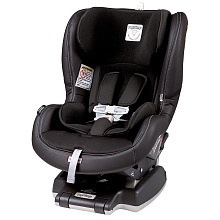 The safety and style of the Primo Viaggio car seat, now available as a Convertible. The Primo Viaggio SIP 5-65 Convertible follows child from infancy through toddlerhood by converting from a rear-facing to a forward-facing car seat. Provides maximum safety and Adjustable Side Impact Protection. 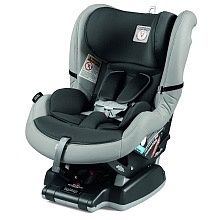 The Primo Viaggio SIP 5-65 Convertible is made with the highest quality of materials, providing complete safety and peace of mind to parents of little ones. It offers added safety features like adjustable Side Impact Protection (SIP), a Shock Absorbing Foam Element (SAFE) device, Expanded Poly Styrene (EPS) energy-absorbing foam and an anti-rebound bar. Solid anti-rebound bar for use in rear facing mode. Conveniently folds under the base for forward-facing mode.